The demands of today's busy life style mean that we all need a first class communication infrastructure in our homes. An increasing number of people are working from home, so up-to-date, reliable systems are even more essential. WireITfree provides a range of modern telecom support services to homes and businesses. We offer an efficient, professional service based on sound technical skills and a high standard of customer care. The WireITfree technical team comprises both telecom and computer engineers. Broadband is a high-speed method of transmitting data, voice and video. It provides simultaneous connections to the phone line and the Internet. You may already have a Broadband service but, from our experience of speaking to our customers, it seems that some services leave a lot to be desired. Our impressive, high speed service and first class support service provides a considerably improved Internet experience. Why not consider a 'change for the better'? The most well known features of VoIP are that it saves you money and provides you with an unlimited calls facility. Some systems offer you your own account which you can use wherever you are, thus saving you even more money. VoIP provides really useful additional features that enable you to manage your calls more efficiently. The digital features of VoIP enable you to integrate calls with other computer applications. VoIP provides an economical, flexible and efficient means of communication for you and your family. Keep connected - make use of the mobile phone network to continue accessing the Internet from laptops away from home, office or wireless 'hotspots'. 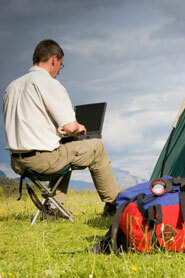 Ask us about mobile Broadband. "Why not consider a change for the better?"